Age 94, of Bennington Twp., Owosso, MI, passed away in his sleep surrounded by his family, March 30, 2019. Clarence was the son of Frank and Clara (Spitler) Ruess. He was born on the family farm which was founded in 1868 by his Grandfather after his discharged from the Civil War. March 3, 1945, he married Izola (Long) and they just celebrated their 74th wedding anniversary. His love of farming started at a young age with his involvement of showing sheep for 4-H. He graduated from Owosso High School. He was outstanding young farmer in Shiawassee County. 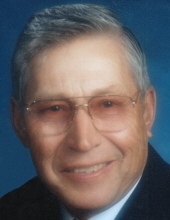 He was an officer on many boards related to agriculture such as Farm Bureau, Holstein Association and Soil Conservative. He was also Justice of the Peace for Bennington Twp. He enjoyed retirement by spending winters in Florida and playing competitive shuffleboard in Florida. He is survived by his wife, Izola, 2 children DeLane and Nancy Ruess and Grant and Klaren (Ruess) Gerhart, 5 grandchildren and 5 great grandchildren, numerous nieces and nephews. He was predeceased by his parents, 1 brother and 3 sisters. A private service and burial will be held for the immediate family. Condolences may be sent to Nelson-House Funeral Homes, 120 E. Mason St. Owosso, Mi. 48867 by mail or their website. Donations may be sent to Nelson House for Friends of Memorial Hospice, or Memorial Respite. The family wishes to thank Oliver Woods Retirement Village and Memorial Hospice for their excellent end of life care. To send flowers or a remembrance gift to the family of Clarence Ruess, please visit our Tribute Store. "Email Address" would like to share the life celebration of Clarence Ruess. Click on the "link" to go to share a favorite memory or leave a condolence message for the family.